A hand exerciser to build grip strength should build up and strengthen the muscles that close the hand. These types of exercisers exert tension in the opposite direction when closing the fingers. A popular hand exerciser used sometimes called web hand exercisers. These exercises have many holes to fit your fingers through so you can adjust your hand position to adjust resistance. Also it allows you to do multiple exercises from gripping the center like a claw or gripping the center to the side. 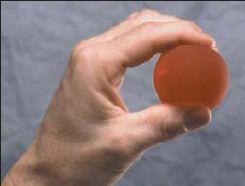 Another type of popular hand exerciser for building compression strength are stress balls and resistance balls. They don't offer as wide range of gripping motion, but they are easy to use and convenient to keep on hand so you can exercise whenever you have free time.